New Design! Now Has Wire Supports! Grow Tub® Raised Garden creates an instant garden for annuals, perennials or small fruits—it &apos;s also great for square foot gardening. 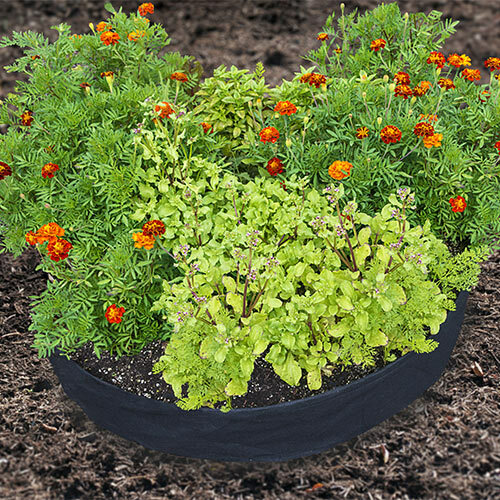 Made from non-woven geotextiles that allow for air and water exchange, this heavy-duty tub encourages a strong, healthy root system for vegetables, fruits and ornamentals. Once the season is over, simply remove growing media and fold flat for storage. Since its introduction, several Gurney &apos;s customers provided valuable feedback on their experiences with the Grow Tub Raised Garden. Our gardening team reviewed the feedback—and redesigned the Raised Garden. It now has wire supports and is round. Bed is 36-in. diameter and 8-in. tall.